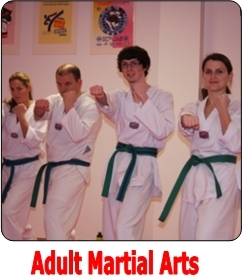 The Adult Program at Choe’s Quality Martial Arts Taekwondo teaches all aspects of Martial Arts and Taekwondo. You’ll learn kicks, strikes, joint locks and throws, acrobatics, falling and more. Portions of each Adult Program include a workout, getting you in shape not just for practicing martial arts but, for living your life at its highest potential. In our adult programs you will experience a unique approach to self-defense and exercise that benefits the body, satisfies the mind and improves your spirit. For serious athletes, Taekwondo training can also maintain sports skills, speed and agility on the diamond, gridiron or, court. Self-defense skills also give adults a confidence level in approaching life’s daily challenges. You will find that the breathing and concentration exercises sharpen your senses and reflexes while allowing you to relax from the stress of daily life. This unique combination of using the power of the body and the mind is the key to increased energy, self-discipline and fitness for a longer happier life.